Hey there, Skill Miner is online to give you an ultimate guidance through the skill market of 2018. I welcome you, a lifelong-learner, to this article. Here you will find an exhaustive information upon which courses according to LinkedIn and Business Insider you should take to boost your soft skills. And what is also quite important – how much it is going to cost you in terms of time and money. The value for the reader is a nice short list of skills plus a list of courses that might help you to develop these skills. However, this research is limited to the courses available on LinkedIn only. Thus a great extension has been made by Mara Leighton in Business Insider. She included learning opportunities from edx, Udemy and Coursera. 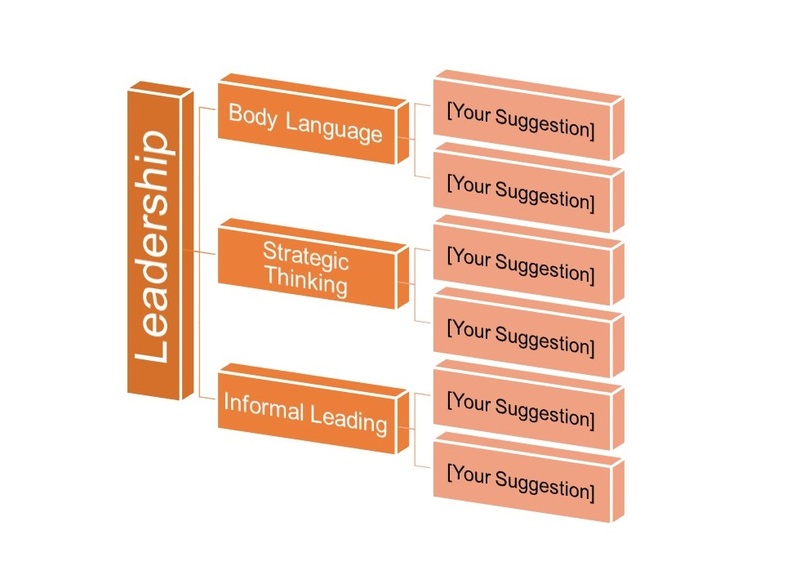 As a cherry on top of a pie the general big skills, like for example leadership, are broken down into smaller ones. And as my dad always taught me: “To eat an elephant you must eat a small bit every day”. By having a kind of a skill tree you can easier define, what is that, that you want to improve. By the way, I am wondering, how much deeper we could go into breaking skills down to simpler elements. Please, write your ideas to the picture below in comments. I really enjoyed reading both articles, but there is one thing which is missing. I still had to spend quite a lot of time to collect together how much time and money I need to jump on this learning adventure. It was great to have the links collected together by experts in one place. What I wanted to do is to squeeze out the real data from them and represent it in an easy and comprehensive way. So, let’s look, how I have managed. As an investor, you investigate the market. Here skills are the goods which have demand and supply. The fair question is how much your skills portfolio is going to cost you in terms of time, effort and money. At the same level of interest is the question: “How the skills are going to pay you back”. I have composed 3 different portfolios based on provided articles. The first one is called “Full”. It simulates a situation if you apply for all of the suggested courses. “Oh boy. It’s really massive”. The simplest time simulation has shown, that if I would spend 120 minutes for learning every day, it would take approximately 220 days to finish everything. The second thought was: “The analytics looks quite interesting”. 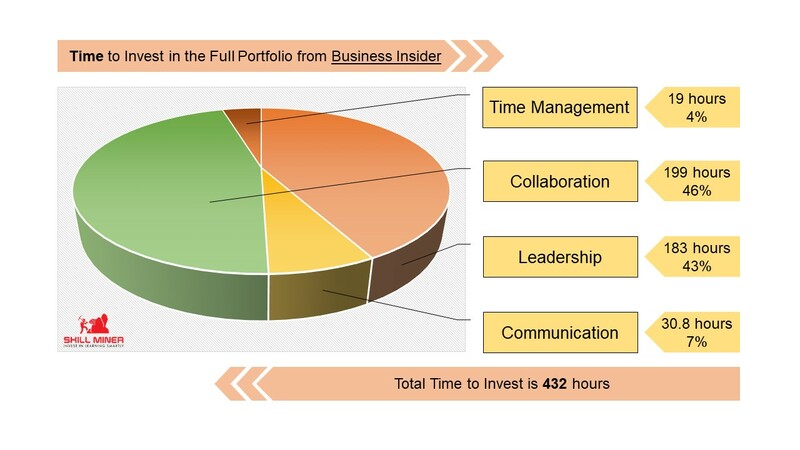 It’s quite expressive that Time Management Skill occupies the smallest segment of a time-pie. So, to some extent, the Time Management courses at least manage their time quite efficiently. It’s interesting, that the highest ratio money to time belongs to the Communication Skills Development. I assume that everybody understands that the only way to master a skill is to practice. Any course in soft skill development is a kind of a lantern, illuminating the path to the skill. To master it you have to practice. However, sometimes you also receive a live example, like for example, I experienced in Chris Croft’s course about sales. So this is my explanation – you receive the shortest tips how to improve this skill and then you have to practice a lot. Leadership and Collaboration are going side by side in terms of both money and time. But let’s see, what would happen if you use only LinkedIn portfolio. The first thing to say – it is the quickest and cheapest way to master this toolset. I can’t give any evaluation currently to the content and quality. I will write a review as I have some life experience. The only judgment I would dare to give is that these courses most probably are very general. The second thing to mention is that ratios money to time have changed, although collaboration and leadership are still going close to each other. 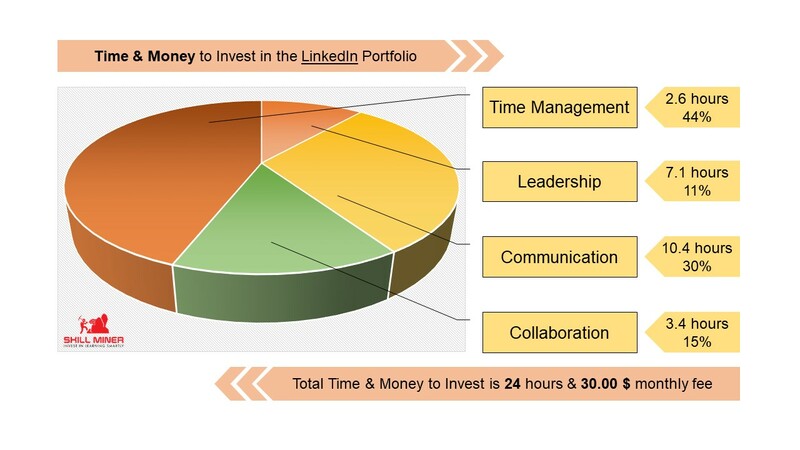 The main reason for the shift in Time Management duration is that in the Full Portfolio in terms of time, which is just 4%, the biggest share belongs to LinkedIn. 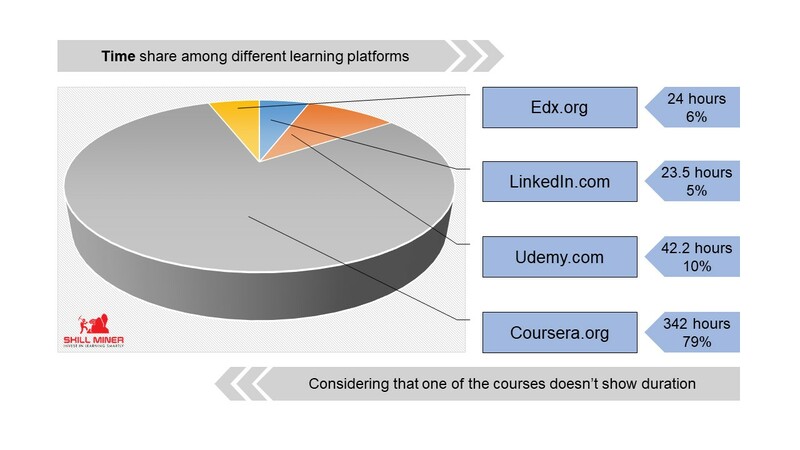 And LinkedIn has quite short courses compared to udemy, coursera and edx, which do not have many programs for time management in the specified articles. Mmmm, so udemy doesn’t really care about collaboration in this research… I am kidding. Before you panic because of the price – udemy has plenty of special offers. If it is your first experience with the platform initial discounts can run up to 95-96%. You can calculate with average 10% from the original price. The difference is quite substantial. The portfolio is time intensive but is still manageable within reasonable time frames. The last analytics in this article demonstrates time and cost share between different platforms. If we consider discounts on udemy, coursera has the highest price share and duration. The important point here is that edx offers a special professional program from R.I.T. called Soft Skills. It covers all 4 skills in 6 courses 24 hours each. The whole program would cost you app 300.00$ and will take up to 3 months to finish. Starting dates of the course are spread between March and July. In the analytics above another course from edx called People Management was considered. Coursera offers really massive programs. One-month trial subscription for each program is approximately 50.00$ it will take months to finish any of them. I couldn’t find the duration of Leadership and Influence, but for example, Strategic Leadership and Management will take approximately 150 hours to finish. So, here we are. Now having not only the directions but some measurables like time and money. I hope that content of this article has helped you to make a decision and has saved your time and efforts. As an additional bonus, you can download an excel sheet [Soft Skills Portfolio Calculator] that will allow you to calculate prices and durations of similar portfolios without my assistance. The detailed guidance how to use it is coming soon. Also, the full portfolio considered in this article is available here. Don’t forget to write your ideas and feedback in comments. I and my project are here to serve your needs in one of the fastest changing markets in the world. Posted on June 4, 2018 by Posted in Courses, Learning PortfolioTagged Collaboration, Communication, investment, Leadership, Soft skills, Time Management.